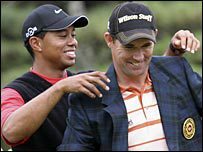 Pádraig Harrington might have had two double bogeys in the second round of the Barracuda Championship in Reno but he got a dream pair for the first two rounds of next week's US PGA at Valhalla — Tiger Woods and Phil Mickelson. The Dubliner, 43 later this month, made two double bogeys off wild tee shots on his front nine at Montreux Golf and Country Club. But he also had two birdies before he turned for home and then picked up an eagle and two birdies in a seven-point round in the modified stableford event being played opposite the WGC-Bridgestone Invitational at Firestone. Harrington's total of 17 points — you get -2 for a double bogey, -1 for a bogey, zero for a par, two for a birdie etc — left him just outside the top 10 and nine points behind clubhouse leader Nick Watney. As for the PGA Championship draw, Open champion Rory McIlroy is in the traditional major champions group with Masters winner Bubba Watson and US Open champion Martin Kaymer. Graeme McDowell "drew" Brooks Koepka and Brandt Snedeker with Darren Clarke alongside Zach Johnson and South Africa's Richard Sterne. Shane Lowry can have no complaints as he's out late on Thursday and earl on Friday with Ryan Palmer and Bob Sowards of Dublin, Ohio, this year's PGA Stroke Play Championship winner for a record fourth time.